Having spent February showcasing the diversity of mongooses in the world I felt compelled to have a round-up post, that would evaluate the different mongoose species and compare them to each other. Hence: mongolympics. To be honest it’s more like an awards ceremony than a competitive event, so maybe Maftas? I’ve already discussed one mongoose species that inhabits some of the islands of the malay archipelago, namely the small indian or small asian mongoose. But there are three species that live exclusively here – Hose’s mongoose (Herpestes hosei), the collared mongoose (Herpestes semitorquatus), and the short-tailed mongoose (Herpestes brachyurus). 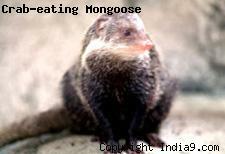 However, these mongooses are very little known. 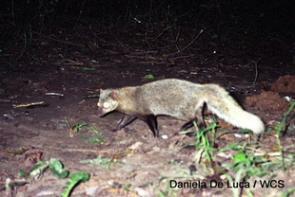 In fact the only photos of any of them which appears to exist on the internet are these two, which show a mutant short-tailed mongoose. You might think it has supernormal powers of healing, but that’s wolverine, who is a mustelid, not a herpestid – i.e. a dog-type, rather than a cat-type (this is explained a little more here). 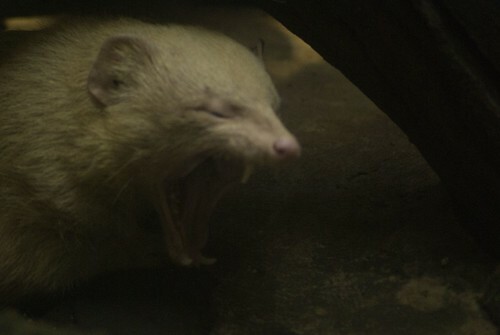 No, the mutation here is just the colour – though not technically an albino, this zoo-dwelling specimen is white. Normally, short-tailed mongooses are a very dark brown, while collared and Hose’s mongooses are sort of reddish-russet-brown. That, of course, is if the Hose’s mongoose exists, which, since it is known only from a single specimen, it may not do. 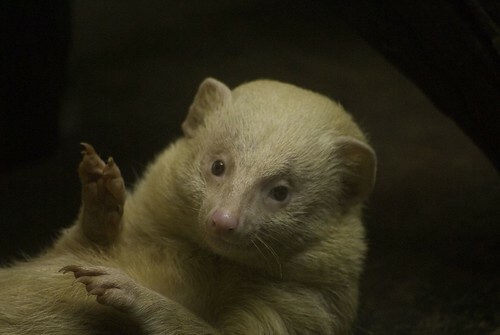 The key point to take away is that this white mongoose is cute and someone should make a lolcat out of it (I say lolcat advisedly, since mongooses are virtually cats anyway). 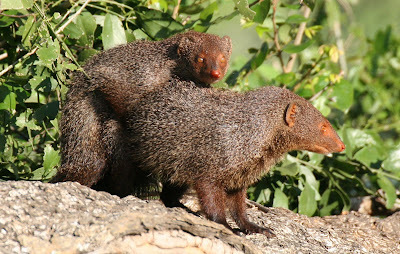 Today I’m going to talk about some of the mongooses that live in India, in particular the indian grey mongoose (Herpestes edwardsii), the indian brown mongoose (Herpestes fuscus), and the small indian mongoose (Herpestes javanicus). 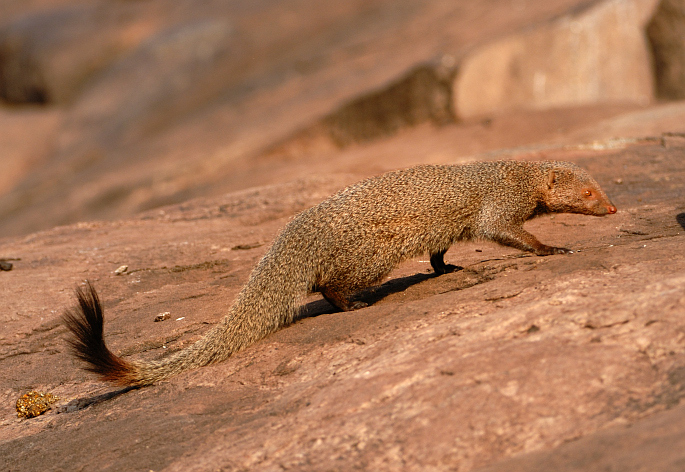 As the name suggests, the small indian mongoose is the smallest, while the indian brown is the largest. 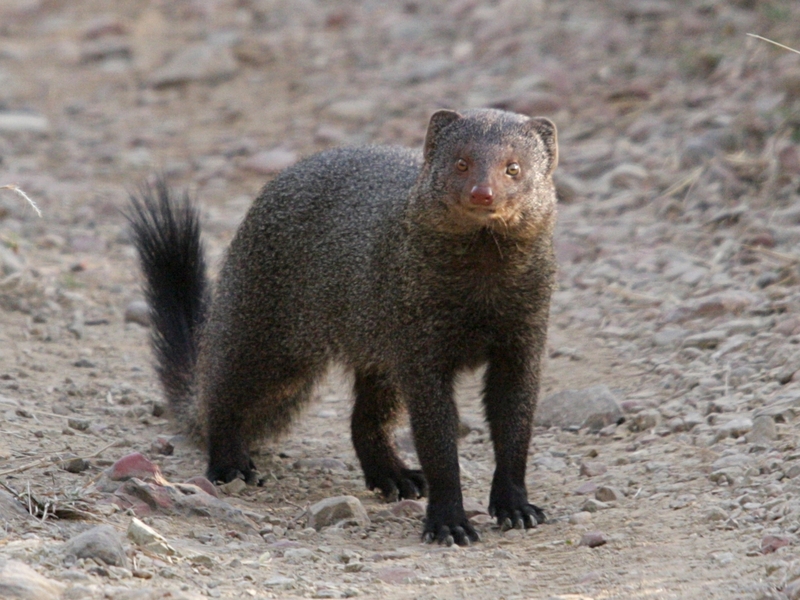 The same ordering applies to their range: the small indian mongoose (as indicated by its other names, like small Asian mongoose or Javan mongoose) is found across most of the southern half of Asia, from Iran to Indonesia. The larger indian brown mongoose is restricted to southern India and Sri Lanka, while the intermediate indian grey mongoose is more widespread than the brown but less than the small, but still covering all of India and a bit beyond. The three also differ in their preferred habitat. The brown one prefers thick forests, the grey one likes bushes and long grass, and the small one is happy pretty much anywhere. The grey and small species are the mongooses most likely to be seen fighting cobras for the amusement of bloodthirsty humans. The most famous literary mongoose is, I believe, an indian grey – Rikki-Tikki-Tavi of Rudyard Kipling’s ‘jungle book’. This story tells of how fantastic it is when the native mongoose risks death to defend the invading British from resentful cobras who had previously enjoyed having the garden to themselves. Despite the cobras being there first, they must die so that the humans can be safe. As you may have picked up, I am not entirely in agreement with every aspect of Kipling’s worldview. The egyptian mongoose (Herpestes ichneumon) is one of the most widely-distributed mongooses, ranging across most of Africa as well as parts of the Middle East and Southern Europe. Just as the Egyptians are thought to have first domesticated the cat, to control mice and keep them away from grain stores, so it’s thought they may have domesticated the egyptian mongoose even earlier for the same purpose. Even today it is sometimes kept as a household pet. The final Africa-constrained genus of mongooses is Bdeogale, who are, like those in the last mongoose-related post, very rare. 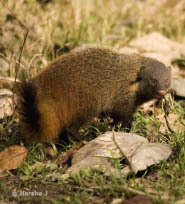 Indeed Jackson’s mongoose (Bdeogale jacksoni) is possibly the rarest carnivore in Africa. It and the related bushy-tailed mongoose (Bdeogale crassicauda) are riddles, wrapped in mysteries, inside enigmas. They also live in Kenya and Tanzania-type area, in the forests (it’s easier to be inside an enigma inside a forest). The black-footed mongoose (Bdeogale nigripes) is a little more common – merely a riddle wrapped in a mystery, outside an enigma. It dwells further west, around Nigeria, Cameroon, Congo and Angola. All three species look fairly similar; dark fur, fully black on the legs, with bushy, fox-like tails. All appear to be largely nocturnal, terrestrial, and solitary.